Located in the downtown business district, this landmark San Jose hotel is 3 blocks from the SAP Center and 5 blocks from the convention center. Very clean and well kept. Recently remodeled. Very pleasant stay. Close to eating and airport. Where to find San Jose hotels near an airport? How can I find hotels in different San Jose neighborhoods? Where can I find hotels in San Jose that are near tourist attractions? 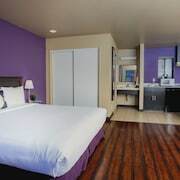 From the affordable to the more upmarket, San Jose offers a generous assortment of comfortable room choices. Approximately 99 places to stay are within a 0.1-kilometre (0.1-mile) radius from San Jose's downtown area. Finding a place close to the heart of San Jose is just a couple of mouse clicks away. Expedia's comprehensive database features the Hotel De Anza and The Fairmont San Jose, all of which are within a 1-kilometre (0.6-mile) radius of the town center. Of course, a vacation in San Jose wouldn't feel complete if you don't take a trip to Winchester Mystery House. The Hotel Valencia Santana Row and Holiday Inn Express Hotel & Suites Santa Clara, are convenient options for those staying in the area because they are within walking distance of Winchester Mystery House. 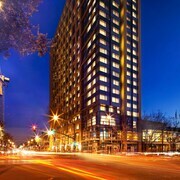 Accommodation options that are close to the San Jose State University include the San Jose Marriott and The Westin San Jose. The Hyatt Place San Jose/Downtown and Hilton San Jose are handily situated within strolling distance of the Tech Museum. San Jose Convention Center and the San Jose Museum of Art are other often-visited San Jose destinations. 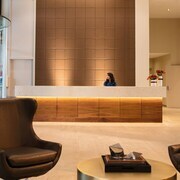 The Four Points by Sheraton San Jose Downtown and the Arena Hotel are within walking distance from San Jose Convention Center, while the Quality Inn and the Americas Best Value Inn San Jose Convention Center, are close to the San Jose Museum of Art. The Flamingo Motel and Pacific Motor Inn are closest to San Jose Civic Auditorium, while the Holiday Inn San Jose - Silicon Valley and Days Inn San Jose Airport are within walking distance of San Pedro Square.â€¨ The Hampton Inn And Suites San Jose and Hotel Elan are near the Happy Hollow Park and Zoo. 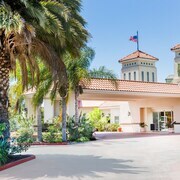 Hotels to book that are nearest to the San Jose Center for the Performing Arts, are the Casa Linda Motel and San Jose Safehouse Suites. Norman Y. Mineta San Jose International Airport is a logical airport for flying into and leaving San Jose. It is 5 kilometres (3 miles) drive away. 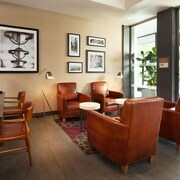 If you would like to stay nearby, try the Homewood Suites by Hilton San Jose or Staybridge Suites San Jose. 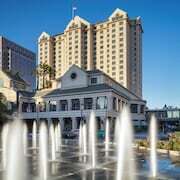 What are the most popular San Jose hotels? Are there hotels in other cities near San Jose? 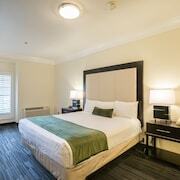 What other types of accommodations are available in San Jose? Explore San Jose with Expedia.ca’s Travel Guides to find the best flights, cars, holiday packages and more!